Looking for DreamHost promo codes and coupons? #MasterTheWeb and save money today with our exclusive The Webmaster offers. Get 40% off your first shared hosting invoice. Sign up for longer for greater savings. Select your chosen DreamHost Coupon. Once you click the DreamHost Coupon above you will be taken to their website showing a red circle at the top right of the page showing the level of discount. On the main part of the screen you will see the discounted monthly price. To take advantage of the offer just select the “Get Started Now” button as shown in the screenshot. This will take you to the configuration screen where you can create your account, configure domain, decide on which billing plan you want to use (i.e. monthly, yearly) and then arrange for payment. Click the 'Start Now' button at the top of the page © The Webmaster. When signing up for hosting the first thing you need to do is create your account by entering your email address and choosing a secure password. The password needs to contain both letters and numbers. You will see the word “good” to indicate that your password is acceptable. Once you have entered your chosen email and password click “continue”. Create your Account © The Webmaster. 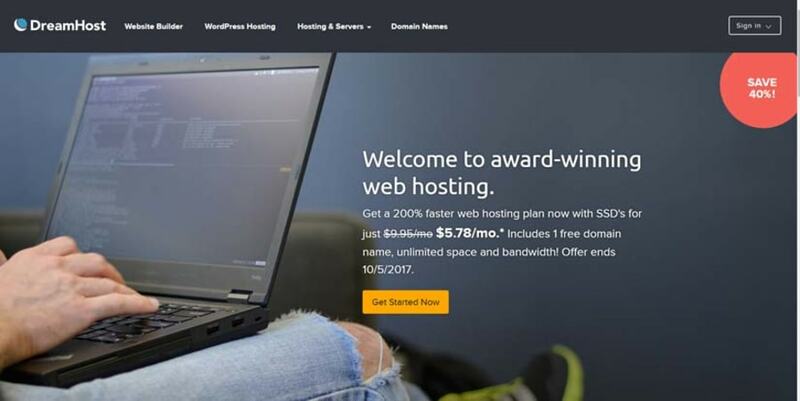 The next step is to search for a new domain to register for your hosting account, enter an existing domain you already own, or start with a free “.dreamhosters.com” subdomain. Alternatively, you can skip this step and configure your domain at a later time. 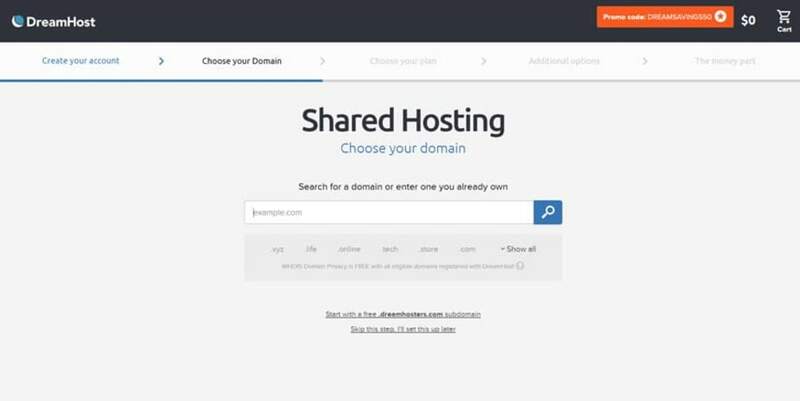 I recommend you only purchase hosting with DreamHost and use Namecheap (see our Namecheap Review) to buy your domain name. Once you have decided on how to configure your domain, click “continue”. Configure a Domain © The Webmaster. You have the option of paying monthly, yearly, or three-yearly. The discount applies to the yearly and three-yearly plans. The screenshot below shows a slight discrepency between the yearly and three-yearly discount, but even so, you still may wish to lock in your savings for three years. Choose your Plan © The Webmaster. The most exciting add-on is the MySQL VPS. This is a premium MySQL database service that uses an isolated Linux-VServer that provides dedicated resources. This makes dynamic websites, such as WordPress much faster (although you may want to consider their specialist WordPress hosting instead). Choose your Add-ons © The Webmaster. Arrange payment for your services. In our experience, you will get an immediate email confirming the purchase, along with immediate setup of your services.although you may want to consider their specialist WordPress hosting instead). They offer two different types of shared hosting; standard and Managed WordPress hosting. Both come with SSD storage and have many different options. If you want additional performance related features, and better WordPress security then you may wish to consider the Managed WordPress hosting, although this does come with some limitations, such as no cPanel, so you should review the specifications carefully before purchasing. Their WordPress hosting has the option of using PHP 5.5 with OPcache (we imagine PHP 7 will be made available soon), HHVM, Varnish Caching and Memcached. Yes, they offer the ability to pay monthly, but it costs $10,95 per month instead of $8,95 per month when you pay for two years in advance. They offer monthly, yearly and two-yearly plans. The best value plan is their two-yearly plans, but there are still some savings for paying annually. Do DreamHost offer a free domain? 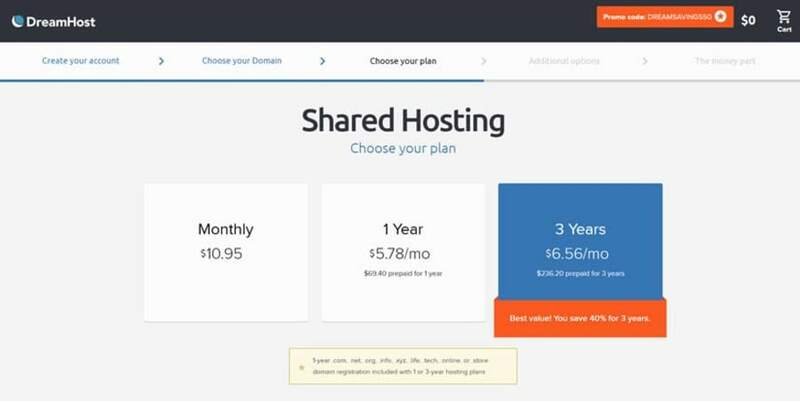 Yes, they do offer a free domain with their standard shared hosting plan. If you are purchasing any items that require payment up front, such as domain registrations, SSL certificates, etc. then the payment must be made via credit card. You can also use PayPal, but you must make a prepayment to your account first. Yes, they do accept PayPal. It only applies to credit card payments. 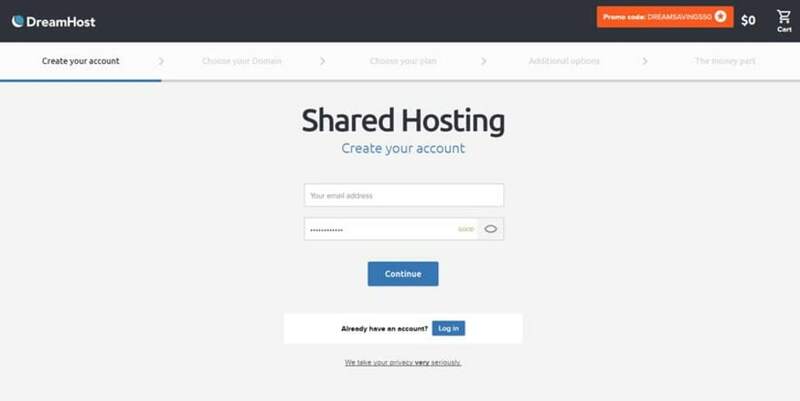 It only applies to their shared hosting plans (not managed WordPress hosting). Yes, the cost of hosting will go up once you renew, as the initial discount offered by our coupons only applies to the first invoice. You will need to sign up for at least one year to take advantage of our discount code. Are there any hidden or setup fees? No, the amount payable is clearly shown when you sign up for your account. There are no additional fees added to your account. All payments of services are made in the USD currency. Therefore, your credit card or bank will set the exchange rate when making payment. Do you have a separate billing department? No, all of their support acts as one unified team. You should submit a support ticket to discuss billing issues. Does DreamHost offer discounts for charitable organizations? Yes, they do. However, we would still recommend using our own promotional code, as it is better. You can then contact them about the charitable discount before renewal. You cannot use our discount at the same time as any charitable discount.